“having a crest”, in reference to the characteristic tufts of hairs of the genus. A genus of small geophytic low-growing plants, solitary or densely caespitose, with fleshy soft stems, globose, strongly flattened, depressed at the apex, with tuberculate low ribs. Areoles having tufts of whitish hairs, spines absent. Huge taproot. Flowers diurnal, self-sterile or self-fertile according to taxa, appearing at the apex of stems, funnel-shaped, whitish, cream-yellow, pink or more rarely red, striped brown or pink, pollinated by flies and bees. 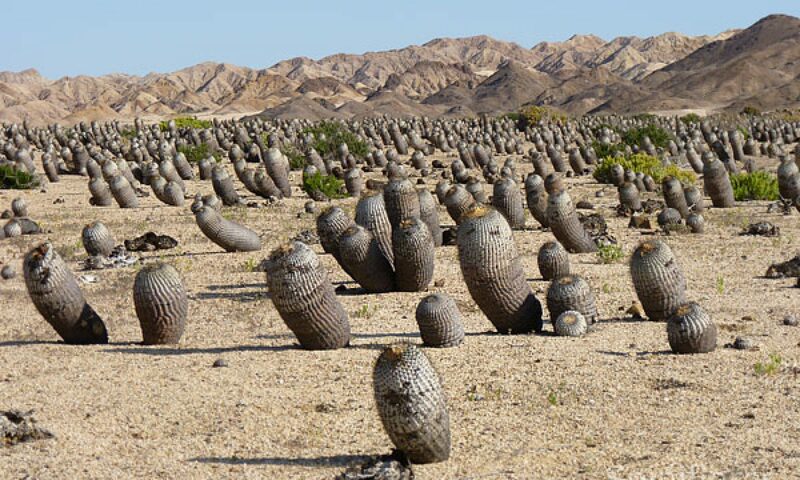 Fruits elongated, naked, floral remains persistent, pale to intense pink or red, sometimes creamy, dry when mature, indehiscent. Seeds pearshaped, tuberculate, black. 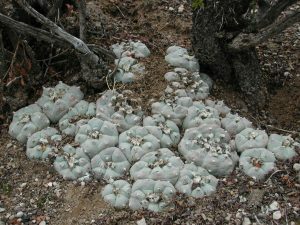 The genus Lophophora has a wide area of distribution and is very widespread in Mexico, much rarer in the United States (Texas and New Mexico), and usually grows on rocky limestone terraces, between crevices, on dry hills, in arroyos (temporary streams), on plateaus or clayey plains, in the shade of the surrounding vegetation among bushes or sometimes in full sun, from 750 m up to 1700 m in altitude, together with other cacti and succulents (Leuchtenbergia, Epithelantha, Ariocarpus…). Mexico (Chihuahua, Coahuila, Nuevo Leon, Queretaro, San Luis Potosi, Tamaulipas, Zacatecas), USA (Texas).